Using vector images has many advantages over using raster images. While raster images are based on pixels, vector images are based on geometric figures which means that they can be scaled without making the image blurry. 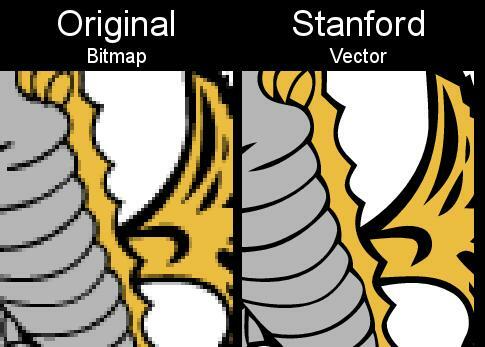 Vectormagic is a free online script provided by the University of Stanford which is capable of converting raster images to vector images. The interface was designed with usability and ease of use in mind. The user is guided thoroughly through the process and explanations are displayed during each step to aid in the conversion process. The conversion begins by uploading a raster image to the website. If the image is too large it will be automatically reduced to one Megapixel. A first analysis is suggesting an image classification automatically which is spot on most of the times. You can select a different detail level from the menu on the right. By default, a medium quality detail level is suggested, which you can change to high or low. High improves how the resulting image looks like, while low makes sure it is not as large as a high or medium image. You can furthermore change the color palette from using unlimited colors to a custom color palette instead which lets you select between 2 and 12 colors only, as well as a couple of advanced modifications to the vectorized image like removing the background or hand-picking a couple of settings like selecting the type of image of the picture you have uploaded to the site. The vector image is rendered every time you make a modification. This takes a couple of seconds, maybe more depending on the size of the image. It is possible to adjust all the settings and render the image again if the output is not looking well. Results can also be edited manually to correct segmentation mistakes. VectorMagic is now also available as a subscription based service for the desktop that adds a couple of extra features that the online version does not provide you with. This includes AI, DXF and EMF vector output, advanced vectorization modes and support for larger images among other features. Awesome. Does someone know how do I actuality know if image is a vector type? Am testat acest site mai demult. Ofera rezultate exceptionale. Pacat ca pe google il gasesti mai greu :). The best online vector transform in the web.